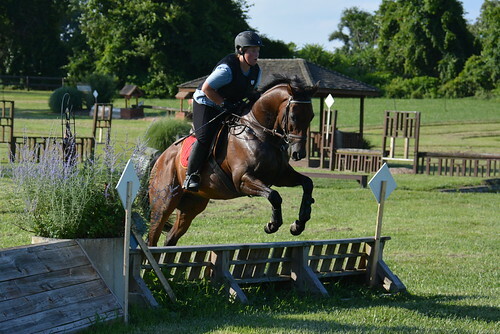 I headed up to the CANTER farm on Saturday. It was 95 degrees and of course all the thoroughbreds were standing up under the big run in sheds. It was actually pretty nice in the sheds and our smart horses know better than to stand out in the sun. I started to panic when I began to look at horses. The are all bays. Perhaps different shades of bay but almost all were bays and I had no clue who was who. The farm manager could be there so I was on my own. You can sort of tell the horses who have been there for a while because they typically are fatter and their feet look better. Those who have been there the least amount of time will look a bit thinner and may still be foot sore. 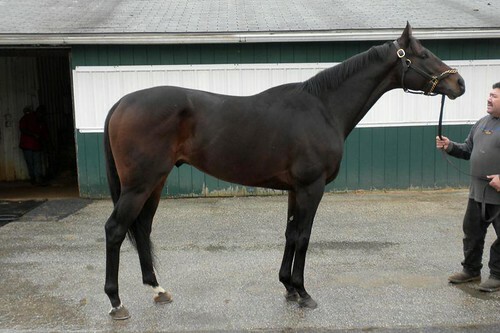 I handle most of the Delaware Park donations and also network with that track so I know those horses well and most of them end up at the farm that is only 35 min from my house so I am over there more frequently. I didn’t recognize any of the horses in the first field. I had to call Allie and get some help. My phone didn’t want to work so pictures weren’t working. Thank god for tatoo’s and pictures we take. This one has two white ankles and a star..this one has a big blaze..this one is a darker bay with a tiny ring around the ankle..this one has a cribbing collar and so it went. I actually picked out Trooper D based on his wild man mane that is super long. 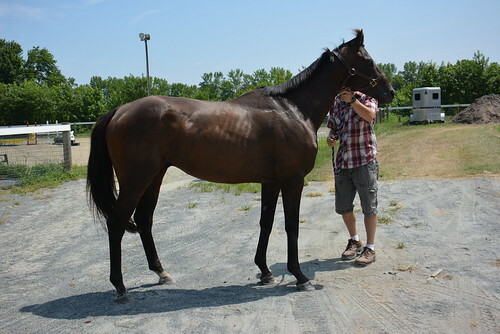 Count Truckee was one of the newer arrivals and was one if the thinner horses (not thin but just thinner than some of the rest) and he looked like the picture that I had seen. I was standing there and I spotted another guy who looked at me with the sweetest eyes. I described him and Allie told me it was Katzimo. I remembered him from his track photo but I couldn’t have picked him out standing there. Katzimo needed some farrier work and Truckee was super adorable but also looked to need a pair of shoes. I took those two out and put them on the trailer. We headed up to the other field to see who was up there. I spotted Corcho (knew him because he was at my farm for a bit) and I recognized the two mares (She’s a Good Girl and Big Talk). Then this other horse came up and started mugging me for attention. He was really cute, fat and had good looking feet. I could tell he had been there for a bit. I was curious who he was so I called Allie again. He was Crazy as Can Be. I thought he looked ready for a job as well. Allie told me to go ahead and take two to the lay up farm closer to me so I could start their retraining when I had stalls and of course pick one for the challenge. I added Crazy as Can Be to the trailer. 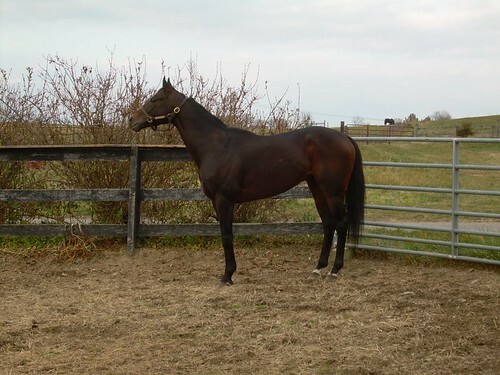 Posso Volare would have been one I would have liked but he is at our North Carolina facility next in line to get restarted down there 🙂 I never found J G’s Jazz Band. It is a big farm and he could have been out eating grass somewhere. They all loaded right up and when we got to the farm we decided the plan would be to unload them all and jog them out on a grass strip to decide who to take home. Kurt was walking two together and I walked one. We stood there and looked at them a bit. I couldn’t figure out what I wanted to do. Each of them was lovely. Truckee didn’t have much foot to nail too. Katzimo was missing a shoe and was quite sore. Crazy as Can be looked good. I stood there and pondered it all a bit. Katzimo was calling to me and not because he was the one who looked ready. He looked sore but he looked like he wanted to please and would appreciate a stall. The other two looked like they could have cared less about anything but green grass. We do often make decisions based on things such as this horse looks like he isn’t thriving on pasture board in the middle of summer. Some do better than others and we try to keep that in mind. Katzimo got back on the trailer and the other two went right into the field and joined the herd. There wasn’t any antics just heads down and straight to eating. We unloaded Katzimo and got him settled in. He got a bath and seemed to enjoy it. Here is what I know about Katzimo and his racing career. 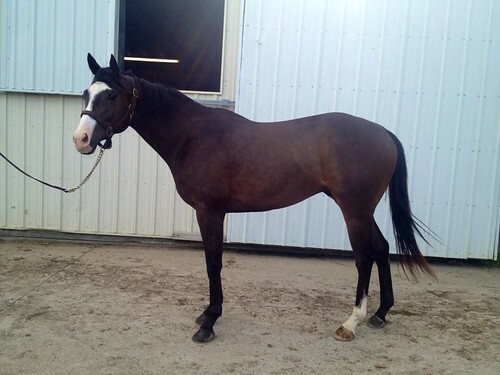 He is sired by Sky Mesa (I have another horse in the barn by Sky Mesa) and was born in February of 2008. He ran 11 times and made $9168. He had a repaired condylar fracture and I am guessing that was the break in his race record from February of 2011 to December of 2011. He came back to racing and raced soundly but was just slow. 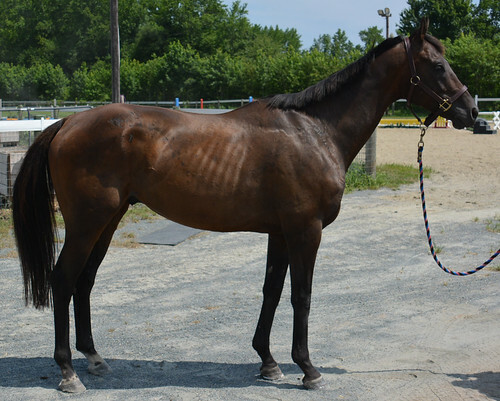 He was donated by his caring owner and trainer when one of our volunteers took his listing at Laurel in January of this year and told them about our donation program. He has just been hanging out getting to be a horse since January. He settled right in and was eager for breakfast this morning 🙂 Today I clipped his muzzle and his ears. He stood there leaning into the clippers. Pulled his mane and gave him a good grooming. Doesn’t mind the fly spray bottle (some are funny about fly spray). My farrier is amazing and came out to get some shoes on him (he had one on and one off) so we could get him more comfortable. He didn’t have a lot of foot to work with so we put aluminum shoes on him so we could use smaller nails. The foot without a shoe is bruised up so I packed him with magic cushion. He was already walking better tonight. He has his own stall that open up into a small paddock. I didn’t want him running around with my herd on his sore foot just yet. He is happy to just cruise around between his stall and paddock. Loving his yummy alfalfa. He looks pretty silly in all of his fly gear but I think he likes it. Fly sheet with neck and fly boots to keep him from stomping. Gotta keep those shoes on! He will let me know when he is ready to start some work but I think with the shoes on he will come around quick. I am headed up this weekend to pick one out. Looks like the weather should improve for next week. I refuse to subject my horses to being ridden in this crazy hot weather. Even this morning at 5:30 it was hot and humid. If i could ride at that hour it might be possible but I have to go to work. I have lights so I could ride late at night but really nothing needs to be ridden that bad! Good week to just take it easy. I think that I tend to slow down on my writing in the summer because I don’t have as much time. Kurt and I get into the house about 8-8:30 pm and then look around for some dinner and by then it’s 10pm and time for bed. It is hard to ride at 4pm when it is so hot so I do the chores and then wait for it to cool down a bit but sometimes you just have to deal with the heat. We had a break in the rain for the past week but it is back again. Predicting somewhere between 2-4″ today. Lovely..just lovely! I wrote about Gib over at my makeover journal. He got a workup with the vet and that right hind is bugging him. Vet and I both believe it is the stifle. Recommendation was to add high shoes, do a round of legend shots and lighter work schedule after some rest. 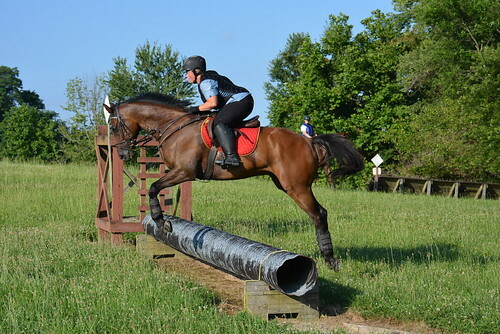 I am going to try to pony him out on the trails tomorrow off of Junior who is now sporting a $$$ pair of glue on shoes. This wet weather is creating havoc with the horses feet. I sold Elusive Sky to my friend and his feet promptly fell to pieces. I fell bad but that is horses. He needs time to grow out some foot. With Gib getting a bit of a break, I have had time to focus more on Letterman. 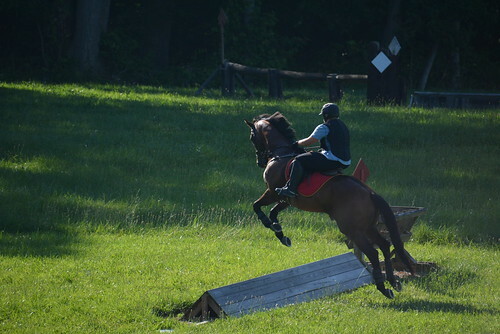 He actually got out xc for the first time in over a year. He wasn’t quite ready as he had only been jumped a few times but we went anyway. 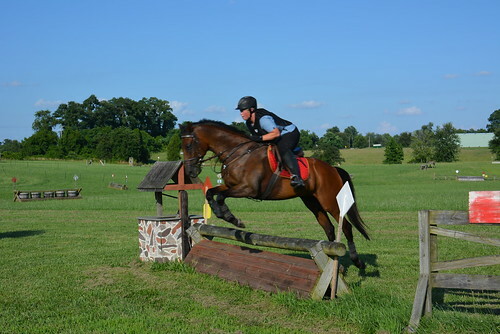 He warmed up for the clinic quite green but got better as we went. He had become much braver over time but being his first time out he wanted to peek at everything. I was very pleased with him but did get a good laugh when I managed to fall off in the middle of the field. I will blame it on Jane’s damn crop circles that she cuts into the fields at Oldehope 🙂 We had two great jumps and I went cantering up the hill with a big grin on my face. I was looking over my shoulder to do a right turn to come down by the water when my horse just disappeared out from under me. He saw the crop circle aka circles cut into the grass and slammed on the brakes and came to a dead stop and then dropped his shoulder. I just popped right off the shoulder. It was hilarious and no harm done. Um, duh it’s Letterman you have to pay attention! I swear he gets me off with the stupidest moves. Giggling remembering the time I had went out with a client for a trail ride. We had an awesome ride and we were all coming back in. I am walking along talking on a loose rein when all of a sudden I was on the ground. Letterman had seen a can/kicked a can? and did some sort of buck stop thing that launched me right off. Gotta love it. I love my horse and I am just so happy when I am riding him. He was pretty happy to be out and about despite the super hot weather. 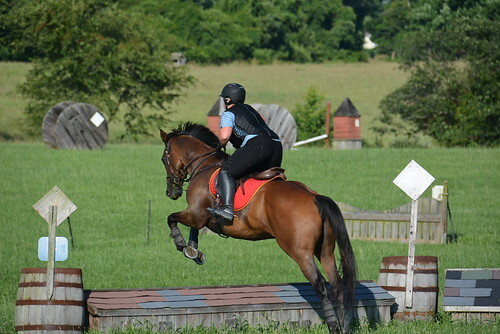 This jump set at this height was our warmup jump and he was less than thrilled. He had to have the rail dropped once but then he figured out what the goal was and he was quite good. I had put this on facebook and people were laughing. Yeah, this was called OMG I am on top of the hill near the pond all alone and these feeders are scary. Can’t go. I said you are going and kicked and we sort of did some weird launch but we got to the other side. 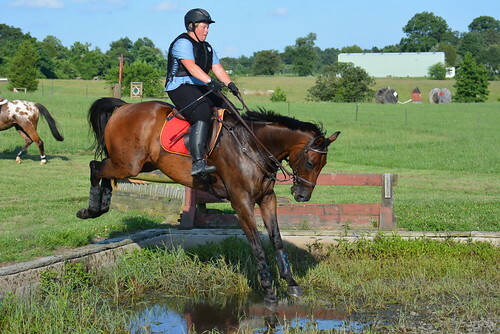 Ditches, water and banks were all no big deal for him which is awesome. I need to get my hands out in front of me! Leg not bad but hands need to go forward and keep shoulders up. Shoulders up is super important on mr. I need to peek at everything because if I tip forward than he drops down and does a strange jump. If I stay back I can keep him out in front of my leg and make sure my leg stays in front of me off the ground. I am no Andrew Nicholson but apparently I was jumping into the water one-handed? Don’t remember that but he was so good about all of this. 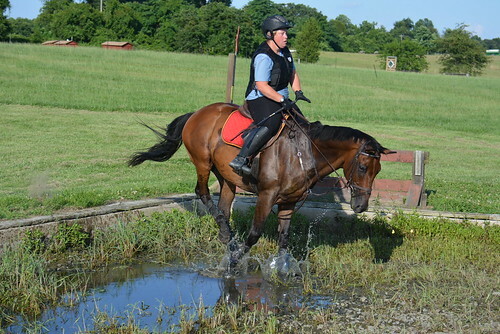 He had never done drops, water or ditches before and had only been out xc one other time since coming off the track. Seems impossible because I have had him for while but he has been broken most of the spring/summers that I have owned him. We were warned that they would try to jump over the puddle and that puddles were bad for this reason. Much better to have a jump filled with water to prevent this sort of leaping. 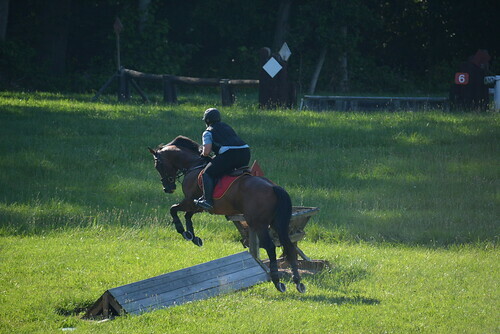 Small jumps but major accomplishment just to be able to get back out to xc. I really love my Letterman even if he is as weird as they come. He was quite grown up the whole day but probably just because it was too hot for him to care. I am getting the new 3yrs going a bit. We did the first ride on Gude Gone Wild the other night. He managed to grab the heel of the shoe so we didn’t get much accomplished during the ride but he was excellent. Amanda is so tall and leggy but she doesn’t look big on him. He was so chill and relaxed for a first ride. Gude Affair was a bit nervous about the mounting block so we worked just standing above him and getting him comfortable. We used the fence to hold him straight and he was relaxing by the end. We lifted Amanda up so she could lay over him but he was a bit nervous about that too so we decided to just let him think on it and do more the next day. Funny how a day can make a difference because he was totally different the next day and stood calmly and mounting was totally easy. Whitney rode him around at the walk and trot and I actually liked him way better under tack than I did just watching him move free. He carried himself so soft and nice in the bridle. Lovely mover and just quite confident about it all. I took a few days off from riding because that stupid fall off Letterman caused me to either pull a muscle or bruise my right hip. You sort of need to be fully functioning for the baby babies 🙂 I wasn’t sure if my leg would be okay if they went boinging around but they were great. They both had gotten a great start at the track which is always helpful. They are just so sweet and pleasant to work on. I have a feeling they will sell as quick as I get my pics/videos done. We planned on getting some pics/video today but not looking good in terms of weather. We had a new donation arrive last weekend who looks super cool. His name is Yesterday’s Story and he was lovely. Nice bay with white who is sound with a sweet personality. He shipped into my farm and then I took him over to begin his layup. I look forward to hopefully starting him down the road. He will get some time to just be a horse. I feel like we are living in the tropics. It has rained darn near every day and it was a record rainfall for June with over 11″. The storms seem to roll in about the time that I get off work each day making it a challenge to fit the riding in. 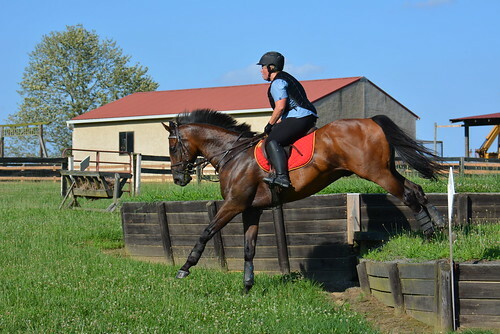 Gib has been having some ups and downs in his retraining. He actually reminds me quite a bit of Letterman when Letterman was starting his retraining. I think many of the issues we are running into are being caused by muscle aches and pains. It seems we have some good days and then bad days but I have yet to figure out a pattern. I just keep plugging away and journaling what it is like to try to figure out a more complicated horse. 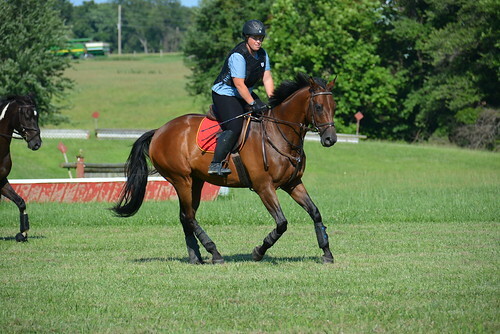 Seems like it has been a while since we had a tricky CANTER horse. Most of the horses we do are very straight forward and quite easy. Leave it to Gib to throw us for a loop 🙂 Perhaps he really wanted to make sure that I show case my ability to work with a difficult Tb for this makeover challenge? 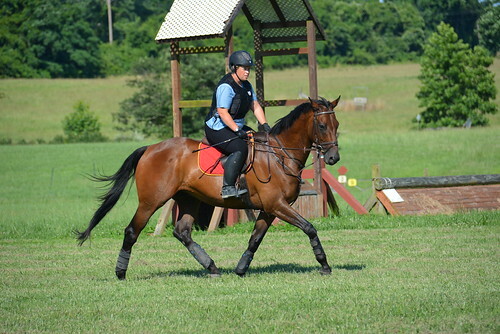 Difficult in terms of training only because he continues to be the sweetest horse ever. We were just snuggling this morning and I brought him in and stuck him under his fan for the day. He is such a lover and snuggles with the best of them. I really think we will get over this hump soon. Letterman is staying sound (knocking on a big piece of wood now) and feels great. We have even added some jumping back in and it has been awesome. Our canter is getting better. 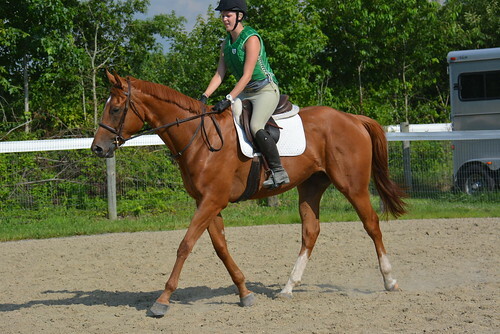 I am looking at some dressage shows for him over the summer while I build up his fitness to get him back to jumping. He seems to have really settled into his private stall that opens up to his small paddock which then goes into a larger grass paddock. He panics if his “stall door” is closed because he is a freak. He has to have his stall open so he can come and go as he pleases. He totally OWNS me! I love his weird self so it is all okay. 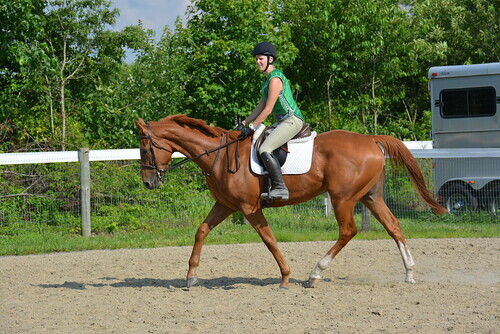 When I ride him I almost can’t believe it is the same horse. He is so enjoyable. 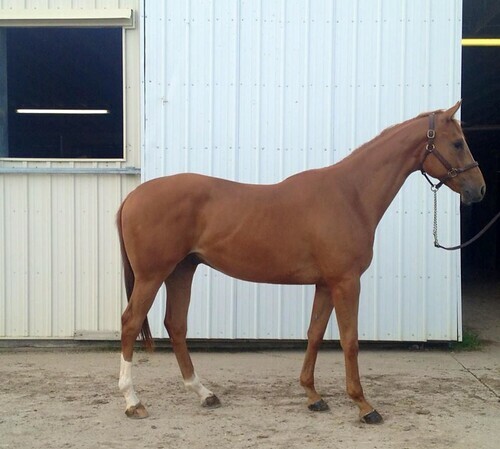 I have been getting amazing reports on all the CANTER horses and my own resale horses in their new homes. I love seeing all the updates from their new families. I did say that I was going to take a break and not buy any horses (unless one really jumped out at me). I will blame it on the rain and my cranky attitude but I did end up buying two horses from Iowa. Yes, I shipped two Tb’s from Iowa based on pictures that I saw on facebook. It took them three days to arrive but they are lovely. Both are 3yrs who trained but never raced. It seems strange that I live in one of the best area for Tb’s but I shipped two from the midwest. However, they were cheaper in cost and the shipping was very cheap. They ended up being more reasonably priced then what I could find locally. He was said to be super quiet and the type that anybody could ride. I just loved his cute face and honestly he was the right size, color and was said to have a great attitude. He is the sweetest guy! Can’t wait to get on him here soon. He looks more like a QH with his face. They were calling him Baldy and we have stuck with that. This is the guy who had really caught my eye. 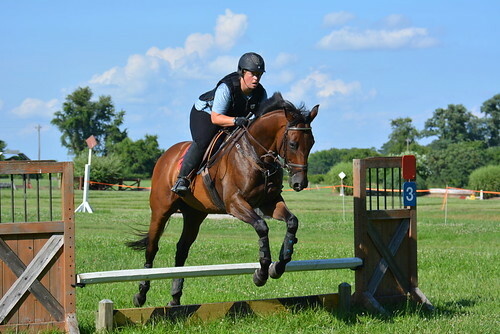 He was said to be over 17h and he just looked like he had the uphill build that I look for in a horse. His name is Gude Gone Wild. I was doubtful that he would be over 17 h but he is pretty darn big. I would say maybe 16.3 which is plenty big! When they arrived they had a cold so they immediately went into the front field that has a run-in shed (away from the other horses) and they have just been hanging up there. They got a vet visit and some antibiotics. They both are feeling much better and in another week they can join the barn. They are super bored right now. I visit with them daily and they love attention. They are both such nice horses. I am so eager to get them started that it is driving me crazy but it has been raining and nasty out so really I couldn’t have done much anyway. I am in the process of getting one of my small paddocks (the one we use for free jumping) turned into an area that actually has footing so I can do lunging and free jumping even when the weather is bad. It will also be a smaller area for riding the babies. My barn has gotten a lot busier and we are finding the need to have two spaces to work. Wish the weather would cooperate so it could get finished. Having this smaller ring will be helpful to working with the young horses. I still do hope to bring one more CANTER horse over at some point. We have many that are ready to get started and are just waiting us retrainers to get time/space.